You can use crayons and black paint to make spooky crayon resist pictures. 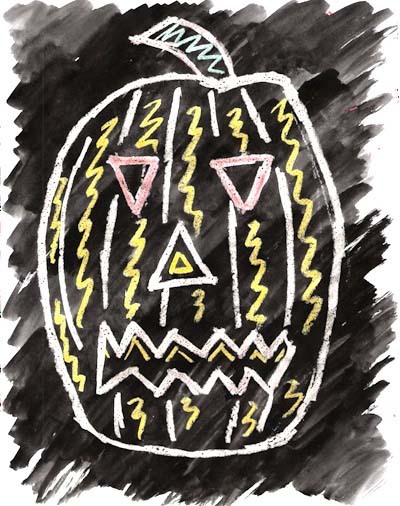 We used Jack-O-Lanterns as our theme but you can use any image you wish. Check out the KinderArt website here for more fun ideas. 1. Draw a design or picture with crayons. Light colors work the best. 2. Make sure to press hard with the crayons so they show up under the paint. 3. When you finish your drawing, lightly brush black paint over the picture. 4.The areas of crayon will resist the black paint. Create your own Jack-O-Lantern or other spooky creation! Email us a picture of you with your creation via our email at the YCBA Education Department and we will post it to our blog.